About 25 percent of 71 cars in my university car park this morning had cute dolls on the dashboard. 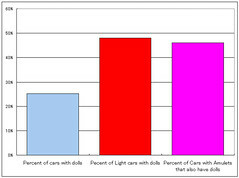 This percentage increased to 49 percent for light cars - which are often driven by women and are themselves cute - and 47 percent for those that also had a Shinto amulet on or near the dashboard of their car. Shinto amulets are in a sense thought to be alive, containing the spirit of shrine at which they were purchased. They are for safety on the roads. It is thought that they somehow act as a "double" or "dummy" (migawari) in the sense that they draw the misfortune that the bearer would otherwise have experienced and bear that misfortune for them, a little like a material version of Jesus or Ambithaba both of whom are said to bear our sins. It is not clear why it is those that like amulets also like dolls. Are the dolls also sacrificial? Do dolls contribute to road saftey? It would not seem to be due to an indirect effect of gender, since the amulets were found spread equally between the (more often male) non-light cars and the more often female light cars. Is it just that the those people that do not mind cluttered dashboards clutter them with dolls and amulets since it is these that are cultural favoured in Japan. This phenomenon deserves further research. You can see the dolls in the following photographs in my photostream.